This post introduces an approach for evaluating the original size of round burial mounds. In one of the places where I’ve worked, burial mounds comprise a prominent feature of the landscape, as illustrated in the following photograph. This prominence may be amenable to explanation through formal high-level theory. Mound size, for example, may reflect the labor used to produce it, suggesting something about the size and organizational capabilities of the group that produced the mound. In order to use this feature of the monuments to evaluate high-level theory, the modern size should be an accurate reflection of the original size. Such monuments may erode over time, making them less conspicuous and also less reliable as an index of the characteristics of the group that produced them. Natural weathering may take its toll, but modern agricultural practices probably affected burial mounds to a greater extent. Burials mounds were sometimes plowed repeatedly. These modern practices came later to the region where my case study is located, by which time laws protecting them had been enacted. Nevertheless, various processes leveled many mounds, perhaps decreasing their height and increasing their diameter. 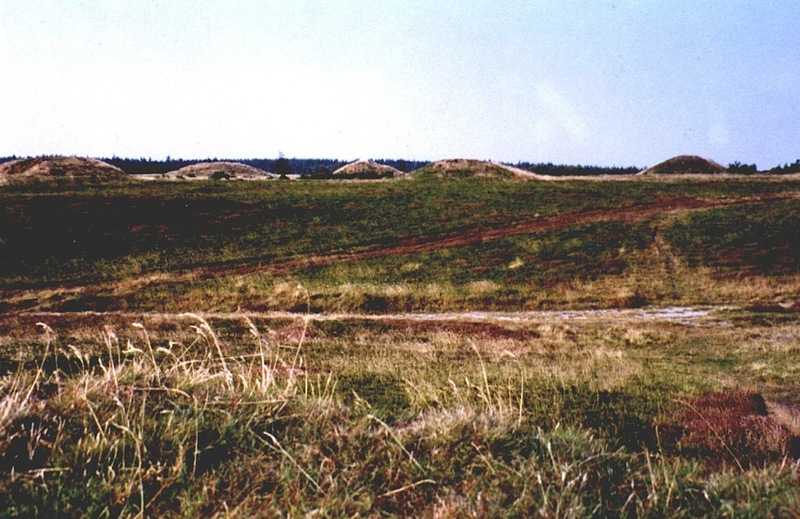 Despite these depredations, the original volume of the mounds may be preserved. Mound shape can be modeled as a spherical cap, a geometric form representing the portion of a sphere above its intersection with a plane. Spherical caps are thus dome-shaped. The following figure illustrates a spherical cap. 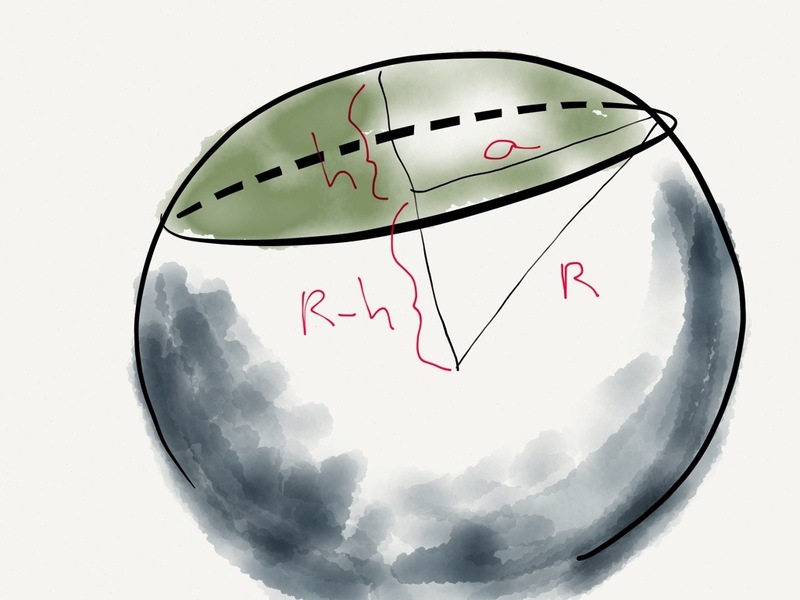 In the figure, h is the height of the dome, a is the radius of the dome’s base, and R is the radius of the sphere. Importantly, the calculation of the volume of a spherical cap does not depend on the radius of the sphere of which it is a part. The maximum possible original height of a mound, however, should be equal to the radius of that sphere. This height can be calculated by holding the volume constant and finding this value of the height and radius. At that point, the height and radius will be equal. Subsequent posts will explore these ideas further and play with some data on mound size. © Scott Pletka and Mathematical Tools, Archaeological Problems, 2013. In an earlier post, I noted that the parameter estimates for a mixture model supplied by maximum likelihood methods were only part of the story. A measure of the precision of those estimates is also needed. Confidence intervals provide this measure. This post details a method for determining them. Packages for the analysis of mixture models in R like mixdist generate confidence intervals automatically. The direct search approach, however, has proven to be more reliable for the data sets that I have been examining. In a direct search, the likelihood is calculated for each combination of parameter values over a plausible range of those parameter values. The likelihood value of each combination is calculated by looping over a sequence of parameter values for each parameter. The interval between the values of a parameter used in the calculations should be relatively small. When small intervals are used, however, the number of combinations of parameter values for which likelihood values must be calculated increases rapidly. Direct search of the parameter space may not be practical for some applications. The direct search approach requires that a balance be struck between precision and manageability. In my previous post on this topic, I discussed two techniques for finding the combination of mixture distribution parameters that have the lowest log likelihood, direct search and the mixdist package for R. I suggested that direct search of the parameter space allowed the effects of outliers in my data to be identified more clearly. I have done additional work since that time, comparing direct search and the mixdist package. As a result of this work, I have concluded that direct search is much more effective at finding the optimal combination of parameter values. Mixdist returned parameter values that consistently produced higher log likelihoods than I found using direct search. The differences were substantial. I can not fully explain the observed differences, but the differences were also consistent among all of my data sets. Direct search of the parameter space is obviously not the most convenient approach. My model involved only two lognormal distributions with a total of five parameters. Direct search of the optimal parameters for more complex mixture models may not be feasible, as the number of parameter value combinations that need to be searched is too large. For simple mixture models, however, the direct search may be preferable. The following code is the very simple program that I wrote for R to find the lowest log likelihood and corresponding parameter values. The program was written specifically for a mixture model of two lognormal distributions. 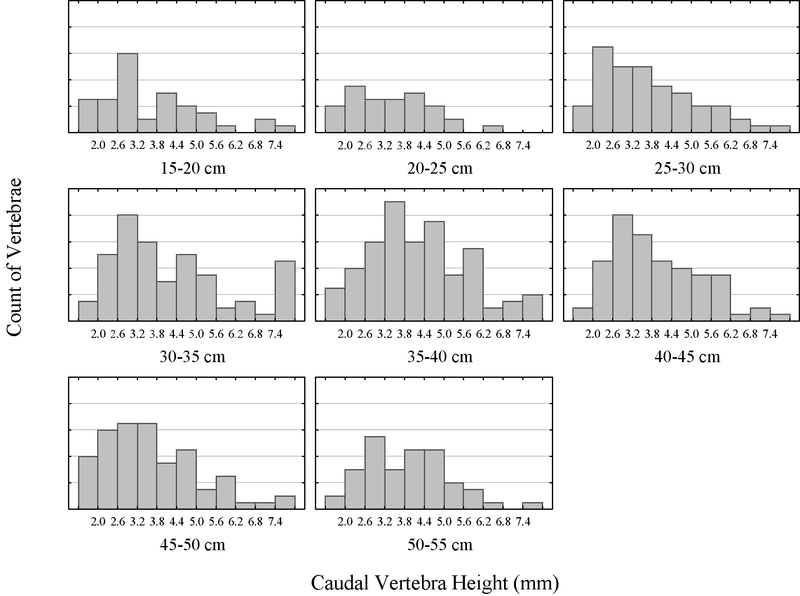 The parameter value search space included the range of likely values of log mean of fish vertebra height and the log standard deviation of fish vertebrae height in both of the two distributions. I am not a professional programmer, as you will see, so any suggestions for improving and extending the code will be greatly appreciated. #pvec provides the sequence of values for the proportion of vertebrae in the mode of smaller (net-caught) fish over which the program loops. #mean1vec provides the sequence of values for the log mean of vertebra height in the mode of smaller (net-caught) fish over which the program loops. #sd1vec provides the sequence of values for the log standard deviation of vertebra height in the mode of smaller (net-caught) fish over which the program loops. #mean2vec provides the sequence of values for the log mean of vertebra height in the mode of larger (hook- or spear-caught) fish over which the program loops. #sd2vec provides the sequence of values for the log standard deviation of vertebra height in the mode of larger (hook- or spear-caught) fish over which the program loops. #loglike is the negative log likelihood, which is calculated for each combination of parameter values. #p stores the parameter value for the proportion of vertebrae in the mode of smaller (net-caught) fish. #mean1 stores the parameter value for the log mean of vertebra height in the mode of smaller (net-caught) fish. #sd1 stores the parameter value for the log standard deviation of vertebra height in the mode of smaller (net-caught) fish. #mean2 stores the parameter value for the log mean of vertebra height in the mode of larger (hook- or spear-caught) fish. #sd2 stores the parameter value for the log standard deviation of vertebra height in the mode of larger (hook- or spear-caught) fish. #the finalresult data frame stores the log likelihood and parameter values for the combination of parameter values that returns a log likelihood that is smaller than all other log likelihoods generated. When I employed the direct search, I ran it twice for each data set. The first time, I looped over a wider range of parameter values. The sequence of parameter values searched within each variable was spaced sufficiently far apart so the direct search would not bog down. The one exception was the proportion of fish vertebrae in each mode. For this variable, the step-size between the values of proportion for which I calculated the log likelihood was fairly small from the start. Experience with my data sets showed that this variable had the biggest effect on the log likelihood. The second time that I ran the direct search for each data set, I focused on a narrower range of parameter values. The range of parameter values that I searched centered around the values found in the initial run. The sequence of values searched within each variable was spaced closer together in the second run. Additional code, of course, needs to be written in order to determine the standard errors of the parameter estimates.